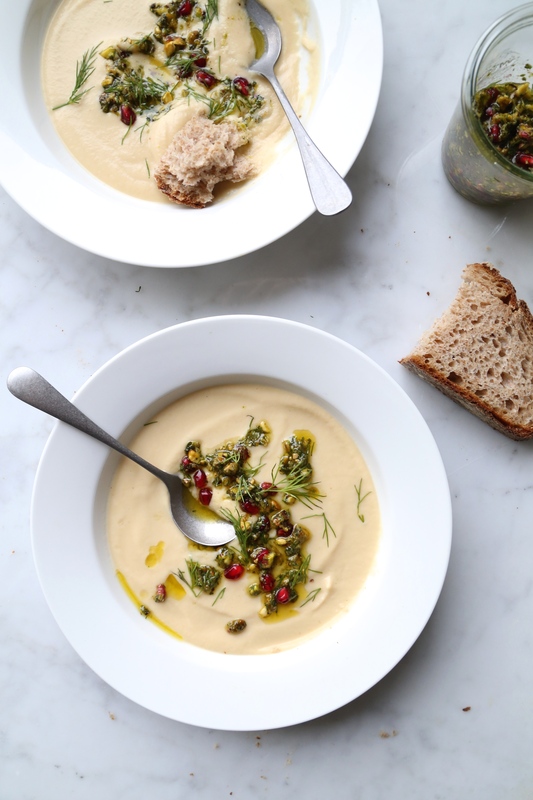 My recipe for ‘Cauliflower Tahini Soup with Pomegranate Herb Pesto Soup’ was influenced by a recent dinner at Jean-Georges’ abcV. Their whole roasted cauliflower with tahini sauce, pistachios, and herbs was out of this world. One of the most enjoyable vegetable dishes I have had was easily translated into a soup. During these colder months, soup is a great way to maximize your vegetable intake. Using a high-speed blender, you can create a perfect velvety and creamy soup without any added dairy or nut milks. You will be surprised how creamy this soup is with just cauliflower and a sweet potato. Like many of my recipes, this one is inspired by what is in season. Right now and until February, you can find fresh pomegranates at the supermarket. There is something magical about cracking open a pomegranate and exposing it’s beautiful ruby seeds. The less magical part is the mess you makes when picking out the seeds. Here is a great method for removing the seeds. Or be fancy and pay double to get a small container of seeds. Colder months also bring a wide variety of potatoes in different shapes, sizes, and colours. In this recipe I used a white sweet potato because I wanted the soup to be white in colour. If you have trouble finding one feel free to use an orange sweet potato. Place all of the ingredients except the pomegranate seeds into a a food processor. Process until chunky (do not over process) Stir in the pomegranate seeds. Preheat the oven to 375° F. Line a baking tray with parchment paper. On the baking tray, toss the cauliflower and sweet potatoes with 1 tbsp of olive oil and season with sea salt. Roast for 25 minutes or until cauliflower is golden and tender. In a large pot, heat remaining 1 tbsp of olive oil over medium heat. Add the onions and garlic and cook until softened, about 8 minutes. Stir in the roasted cauliflower and sweet potato. Add the vegetable stock and bring to a boil. Turn down heat and allow to simmer for 5 minutes. Add to the blender along with tahini and lemon juice. Blend until smooth. Season with salt and pepper. Serve bowls of soup with a spoonful of pesto. 2. Spread the pistachios evenly on baking tray. 3. Place in the oven for about 6 to 8 minutes They will become very fragrant when they are done. This entry was posted in Soups and tagged Autumn, blender soup, dill, local, mint, pesto, pomegranate, seasonal, soup, winter. Bookmark the permalink.